My Gm calls the Kinetic Bombs that Prince Valanar summons during the Blood Princes fight Beachballs – so I’ve nicked it for the purpose of this, and I like it. It’s rather fitting don’t you think? They are bright, bounce around, and annoy you when you cop one to the face. I got given the task of looking after the ‘Beachballs’ on The Blood Princes fight in our 10 man. The Balls explode when they hit the ground so they have to take direct damage to keep them up in the air. The Balls convert the damage to energy to help them float. as a disclaimer, we haven’t killed princes as at the time of writing this post. Maybe we will tonight, and I shall update – but it’s something we are working on, and I like putting my working outs on paper. this thread on ShadowPriest.com features a few Shadow Priests crying at having to use our wands, but they also mention that Improved Devouring Plague works for the direct damage component on cast – but the rest of the dot cast is useless and you can go OOM spamming it for the direct damage. Mystic Chicanery has some good points for a Warlock assigned to Kinetic Bombs here – Locks have the advantage of having a pet to throw on one, and while not ideal because of its cooldown – I was able to use my fiend on one, of our attempts to give me time to get across the room ( those blighters run fast ) Mystic also says ” The harder you hit them the further up they pop” However I noticed that a couple of wand hits were more affective then a MB or a SWD – except I really hate wanding. Brings back memories of feeling useless on General in Ulduar. The Kinetic Bombs despawn after a minute or two, so you keep needing to obtain new targets, and keeping range on both balls and avoiding bad stuff got hard. That almost sounds like they put the worst class possible one it. Why not a mage or moonkin? I imagine moonfire would make a great emergency button and then wrath has a fairly short cast time. Exactly what Kelp said, imo. You mentioned having a hunter in the group. why wasn’t he doing it? 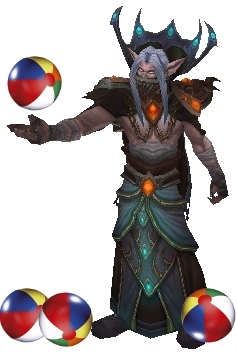 unless he was tanking kelseleth he would’ve been better suited to juggling duty. As you said the pet is useful for juggling another orb while the hunter runs for the other. pets = win on the orbs. The enrage timer is so long on this fight that you can just about ignore it. One hard mode 25 strat actually has melee not attacking the empowered Valanar to avoid vortex damage. Run 3 or even 4 healers on this fight. This fight can be out-healed. Get your hunters, warlocks, and DKs to use their pets. If you’re on the far side of the room then get somebody else, even a gun-wielding warrior, to whack a beachball. DPS really does not matter for a competent group. You can survive a falling beachball, but the chance of wipe is so high that anyone should go out of their way to keep it from happening. I’ve even cast Exorcism while healing.